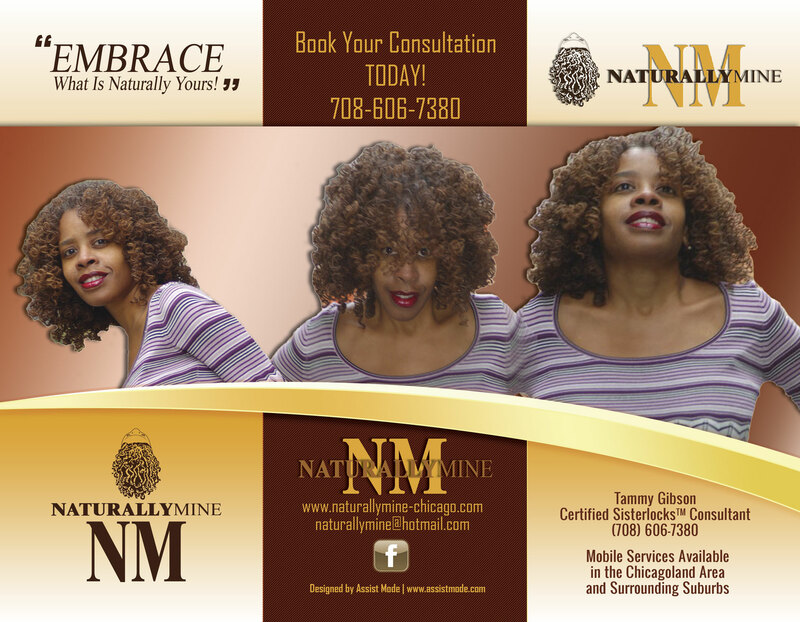 Tammy Gibson is regarded throughout the Chicagoland area as an authority in the natural haircare industry. Her personal natural journey began 10 years ago after becoming frustrated with the results of chemically straightening her own hair. As a Certified Sisterlock Consultant with over 100+ clients, Tammy is educating women of color on how to maintain a chemical-free coiffure. Her company Naturally Mine specializes in Sisterlocks™, a natural hair management system that allows women with tightly textured hair to take advantage of a wide range of today's hairstyles such as updos, braid-outs, spiral curls, twist-outs, straw sets and so much more, without having to alter the natural texture of the hair. In addition to her passion for hair care, Tammy makes time to support a meaningful cause, breast cancer. She launched My SHERO Awards initiative, which gives the loved ones of breast cancer survivors the opportunity to share battle stories. Each year in October -- Breast Cancer Awareness Month – the best stories receive "Pinky Promise" handbags for breast cancer survivors. Tammy has donated more than 100 “Pinky Promise” handbags. Tammy is also a vital contributor to the All About Pink Foundation, a Chicago-based foundation established by Dr. Mable A. Alfred, a breast cancer survivor. Naturally Mine continuously provides donations of wigs and hair care products to breast cancer survivors and homeless shelters, earning Tammy the “2011 Award of Achievement" from the All About Pink Foundation. Tammy is the founder of S.H.E. (Successful High-Minded Entrepreneurs), an on-line networking group that empowers and motivates small business women in their endeavors to be successful entrepreneurs. Tammy graduated from Chicago State University with a B.A. in African American Studies and a certificate in legal secretarial science from Robert Morris College. Tammy is a proud member The Slave Dwelling Project, Order of the Eastern Star and Iota Phi Lambda Sorority, Inc., Alpha Chapter. Her spare time is spent in graphic design, engaging in community service, traveling to African American historical sites, empowering women and enthralled in the pages of a good book. Tammy resides in Country Club Hills, IL, where she is a loving parent to her son, Receo Thomas Gibson.